FREE pair (2) of Breathable Pads with the purchase of your Sherpa pet carrier. Help protect your carrier for years of traveling with your pet. The Sherpa Pet Trading Company was the first company to design an approved pet carrier that strictly adhered to airline standards for in cabin travel. They continue to produce some of the highest quality products in the industry. Entry from generously-sized top or side zippered entries. Inside bottom has a removable and washable sheepskin liner that serves as your pet’s bed away from home. Zippered side pocket for your pet's toys and treats. This pet carrier is backed by the Sherpa Guaranteed On Board Program. For pet travelers flying on American, Continental, Delta, AirTran, Southwest, United, Alaska Airlines and Northwest Airlines, this great program will guarantee that your pet will be able to board the cabin of the aircraft as long as your Sherpa carrier is the appropriate size for your pet. Even if your pet is not traveling on any of the airlines previously mentioned, this pet carrier is airline compliant and should fit under the seat in front of you. As it is a flexible carrier, it affords the possibility of fitting in a space that is less than the 10.5" height of the carrier. Is This Carrier the Right Size for your Pet? For your pet’s comfort, and to meet airline requirements, your pet should be able to stand up and turn around in their pet carrier. 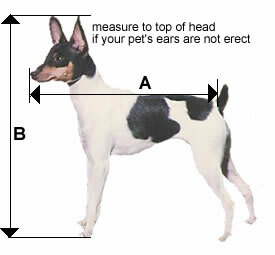 Measure your pet from the tip of the nose to the base (not tip) of the tail (A) and from the top of the head or ears to the ground (B). If you have any questions, please contact us toll free at 877-241-0184 or email us at custsvc@pettravelstore.com prior to placing your order. For pets who can experience an accident in their carrier because they are nervous, elderly or ill, we recommend our smallest size pet pads which will fit perfectly into Sherpa carriers (petite size). These pet carrier pads will keep your pet dry and comfortable during travel. For pets that get upset or overly stimulated when traveling, we recommend all natural pet calmers for dogs or cats. These all natural treats can take the edge off of nervous or hyperactive pets. If you have any questions, please contact us toll free at 877-241-0184 or email us at custsvc@pettravelstore.com prior to placing your order. Click here to see more airline compliant pet carriers. You can click here for current information airline pet policies. I have used this for my 9lb Chihuahua on several intercontinental and international flights. He likes it. It is well made, easy to carry, and I would recommend it to anyone.